Once again we will gather to see what everyone has accomplished over the winter. Every year for over 10 years we have been meeting at the beach at Bluff Point State Park in Groton, CT to talk about making kayaks. If you are interested in making your own kayak, just like to look at kayaks or have built your own you are welcome. Bring a boat if you have one, but it doesn't have to be home made. Generally people are happy to let you try out their boats and someone from Chesapeake Light Craft often drives up from Annapolis with a trailer full of boats to try. 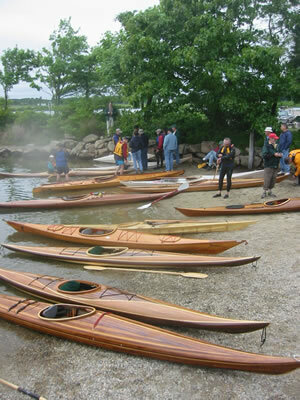 This is a non commercial gathering of people who like kayaks or related small boats. Last year there were a bunch of stand up paddle boards as well. Saturday, June 2, 2012, 10:00 am to about 3:00 pm rain or shine. Turn south on 117 towards Noank & Groton Long Point. Follow 117 for about 1 mile to Route 1. DEPOT RD will go under a railroad bridge and turn to dirt. Follow to the end and parking. The closest access to the water is on the right.